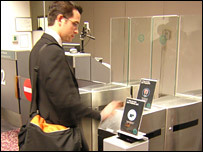 Passengers at Heathrow airport are being invited to take part in a trial of high-tech biometric scanning equipment, which aims to make the travelling process easier by getting people through identity checks faster than ever before. When people are off to catch a flight, they usually check they've got everything. Passport? Ticket? Bumper Sudoku book? All there. But in future you might also need your fingertips to fly. Not only vital for tackling the in-flight meal, fingertips - along with irises and facial features - are all being used in biometric measurements that check identity, a trial system of which has just gone live at Heathrow airport. Initially limited to volunteers amongst passengers flying to Dubai and Hong Kong, the trial will run until the end of January with the potential for expansion should it be deemed a success. The biometric system, called miSense, comes in three stages. 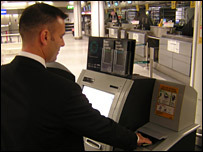 The first sees the passenger use a self-service kiosk to register their passport and a fingertip before checking in using the same machine. Then, when they approach the departure lounge, they simply press the same digit on a panel at the gate and also feed their boarding pass in. Now they are able to browse the duty free. Finally, when they are about to board the aircraft, they offer their finger, boarding card and passport, confirming they are the person who is supposed to fly. In addition there is miSenseplus, whereby a person's 13 biometric measurements are taken - ten fingerprints, two irises, their face - and then submitted onto a card. If you haven't all of these then you offer what you can. This card is then used to pass instantly through immigration at your destination, without the need for waiting in long lines until a moustachioed immigration official scowls at your photograph. Finally there is miSenseallclear, which uses something called Interactive Advanced Passenger Information (iAPI). This references your credentials with your destination country when you check in - it is done in seconds, so there is no delay. Unless you are on a country's 'Most Wanted' list, in which case you would be prevented from boarding the plane. This is not a voluntary scheme, and the details of 100 passengers a day who are travelling to Dubai will be used. A fully operative version is already in place for Australia and New Zealand. However, no action will be taken during this UK-based trial should there be an alert, as the arrangements for dealing with that at Heathrow do not currently exist. Privacy campaigners have accused the government of blindly following the US in its efforts to introduce biometric scanning and say the technology is "unstable and unreliable". Simon Davies, of watchdog Privacy International, said: "At this early stage of biometric understanding this programme can have only extremely limited value." But advocates say the technology would make Britain a difficult place to enter illegally. Among those demonstrating how the system works at its launch is Cyrille Bataller, a biometric specialist who works for Accenture Technology Labs - Accenture has overseen the implementation of miSense. When asked about the possibility of the system being fooled, by wearing contact lenses with fake iris impressions for example, Cyrille smiles. "You can never say you can develop a system that's 100% secure. No-one would ever claim that. "But what you can do is put layers and layers of security that makes it more and more difficult to bypass. "If someone presents a plastic finger with a fake fingerprint, for example, the machine can detect that." In the rather swish surroundings of the Emirates VIP lounge the press gathered around Liam Byrne, the Immigration Minister, who patiently answered questions while snatching mouthfuls of frothy coffee. "This will be very useful in making our borders more secure," he said. "Not as a stand alone system, but as part of something that's a national set-up. 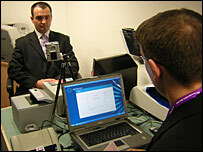 The government wants to take ID cards forward and set out how we want ID cards to tackle immigration in future. "If you've got nothing to hide then why are you worried about ID cards? Today's demonstrations shows that ID cards will make life easier for people. "I think this kind of technology will be popular. People know that borders need to be more secure, they know people want to attack our country and about the threat of illegal immigrants. "But people like travelling so if we can find a way to strengthen our borders, but also make it easier for legitimate travellers, then people will think this is absolutely the right thing to do." Back out in the terminal, emerging from the queue for an Emirates flight to Dubai, was 49-year-old Jackie Colton, a British national who lives in the emirate. She is one of the 400,000 already signed up to the "E Gate" process in Dubai, which is that city's version of the biometric identity system, and she's eager to do the same at Heathrow. However, Mrs Colton explains that the miSense kiosk next to the check-in queue for Dubai is not working. But she remains keen to sign up her biometric measurements anyway, describing biometric-supported travel as "blissful". She said: "It's great and it's got to happen, I'm very confident in its ability. But it hasn't been marketed here very well, I only saw a small item on the news which is how I learned of it. "In terms of easing the flow of genuine, non-risk passengers it's long overdue. If you have nothing to hide then you've nothing to fear."